José Manuel Barroso also said he was “confident” that the United Kingdom would choose to remain a part of the European Union after its upcoming referendum. 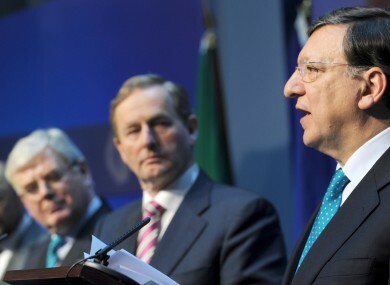 EUROPEAN COMMISSION PRESIDENT José Manuel Barroso told an audience gathered at Trinity College Dublin (TCD) this evening that they were part of a “privileged generation”, despite the ongoing European debt crisis. He then encouraged students to “take part in the debate about the EU”. Addressing the problem of youth unemployment in the European Union, Barroso said that it should be at the forefront of policy-makers minds – saying that the European Commission had fought long and hard for a youth employment programme and an Erasmus programme to help the EU grow. However, he noted that tackling the crisis “goes beyond programmes” and that the EU was working to extend trade with more countries, extend initiatives, and invest more in research. Barroso also defended spending in EU institutions, saying that the cost of administration was small and represented ”value for money”. The amount of the total EU budget allocated to administration totals 6 per cent, he said, deeming it a “reasonable price” in exchange for competent people working on complex issues. “We have some of the best paid lawyers in the world, but we need that,” he said. Barroso said the Union needed the European Court of Justice because, without it, “if a country [was] in crisis they would just help themselves”. The European Commission President also said he was “confident” that the United Kingdom would vote in favour of staying in the EU when British citizens went to the polls on the issue. Expressing his respect for the right of British citizens to have their say on the matter, Barroso said: “They can decide what they want themselves, no-one is here in the EU because they’re forced – they applied to join”. Email “"You are a privileged generation" - Barroso to TCD audience ”. Feedback on “"You are a privileged generation" - Barroso to TCD audience ”.